Unit Text: A.I.F. 2/29 Bn. Additional information: Son of John and Susan Dorward, of Geelong West, Victoria, Australia. Grave/Memorial Reference: Sp. Mem. 19. A. 5. Additional information: Son of Thomas Lowther, and of Annie Lowther, of Kirriemuir, Angus. Grave/Memorial Reference: Panel 64, Column 2. "S" Class destroyer ordered from Scotts of Greenock with Emergency 1917-16 Programme (12th Order). The ship was launched on 6th May 1919 and was the first RN warship to carry the name. Soon after entering service she was fitted with a catapult for experimental trials of Folland aircraft. She was deployed with the Hong Kong Local Flotilla in 1939. Escorted Dutch SS ZAANDAM with refugees from TJilatap bound for Fremantle. 02/03/194: Became detached from faster merchant ship and sighted by Japanese aircraft south of Sunda Strait. In action against IJN cruisers MAYA, ARASHI and NOWAKI with 2 destroyers. Sank after gallant fight. Survivors rescued by captured Dutch ship and later transferred to IJN cruiser MAYA. Exceptionally, they were well treated on board. Additional information: Son of William Frederick and Alexandrina Cunningham; husband of Edith Joan Cunningham, of Nottingham. In March 1945 No 214 (Federated Malay States) Squadron was using Flying Fortress IIIs in electronic jamming sorties. Additional information: Son of James Lowdon Osler and Mima Osler, of Kirriemuir, Angus. Grave/Memorial Reference: 26. D. 23. In September 1945 No 233 Squadron was flying Douglas Dakotas throughout South-East Asia on general transport work. Additional information: Son of Robert Morrison Young and Martha McKay Young, of Kirriemuir, Angus. Grave/Memorial Reference: Coll. grave 11. B. 15-17. "Serial Range P4389 - P4418. 30 HP52 Hampden Mk.B.1. Part of a batch of 120 Hampden B.1. P4285-P4324; P4335-P4384; P4389- P4418, of which:- P4304; P4306; P4312; P4315; P4347; P4369; P4373; P4395; P4401; P4418 were converted to Hampden TB (Torpedo Bomber). P4335 was the first Hampden fitted with balloon cutters. Delivered by The English Electric Co.(Preston) between Feb40 and Aug40. Issued initially to No.61 Sqdn, served also with No.83 Sqdn before joining No.106 Sqdn. P4398 was one of four 106 Sqdn Hampdens lost on this operation. See: X3058; AT121; AT122. Airborne 1755 28Jan42. Lost due to the severe icing conditions. All are buried in the Reichswald Forest War Cemetery. Sgt A.Sporny PAF KIA Sgt J.R.Anyan KIA Sgt A.J.Dickerson KIA Sgt R.McK Young KIA "
Additional information: Son of James and Susan Harris, of Kirriemuir. Grave/Memorial Reference: Sec. 1. Grave 361. Additional information: Son of Isabella Anderson Dickson, of Kirriemuir, Angus. Grave/Memorial Reference: 13. H. 24. In August 1944 2nd Bn Black Watch was part of 14th Infantry Brigade, 3rd Indian Infantry Division also known as Special Force or more commonly The Chindits. 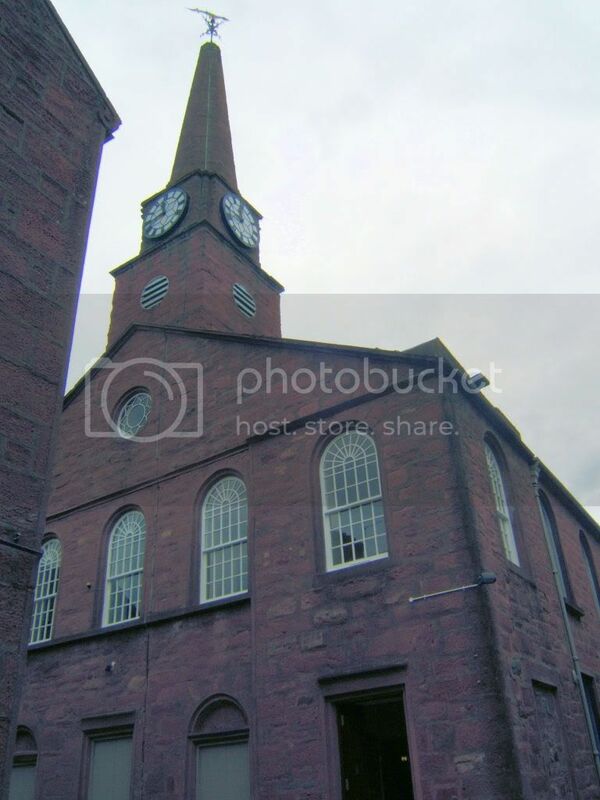 Additional information: Son of William and Betsy Gourlay, of Kirriemuir, Angus. Grave/Memorial Reference: 3. D. 11. Unit Text: 255 Field Coy. Additional information: Son of Mr. and Mrs. Edward Weighton, of Kirriemuir, Angus. Grave/Memorial Reference: XI. F. 13. Out of the eleven names five are buried in Far East graves. Two in the same cemetery in Burma even though they served in different Armed Services and died a year apart. 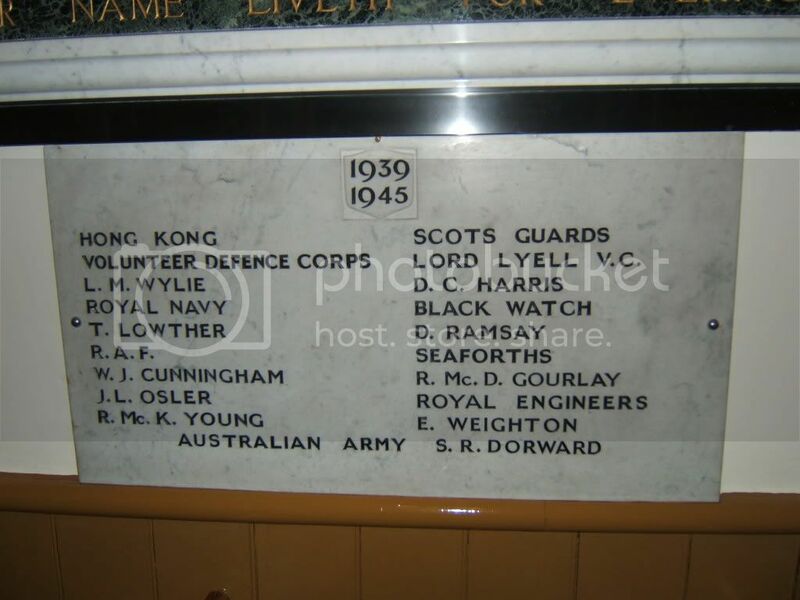 Even the sailor who is listed on the Portsmouth Memorial died off Indonesia. So that gives six deaths in the Far East on this small memorial. The man listed on the Runnymeade memorial was in a squadron in 100 Group which used electronic jamming equipment. It was No 214 (Federated Malay States) Squadron, so there is a Far East connection there too! Also four out of the eleven died after VJ-Day.